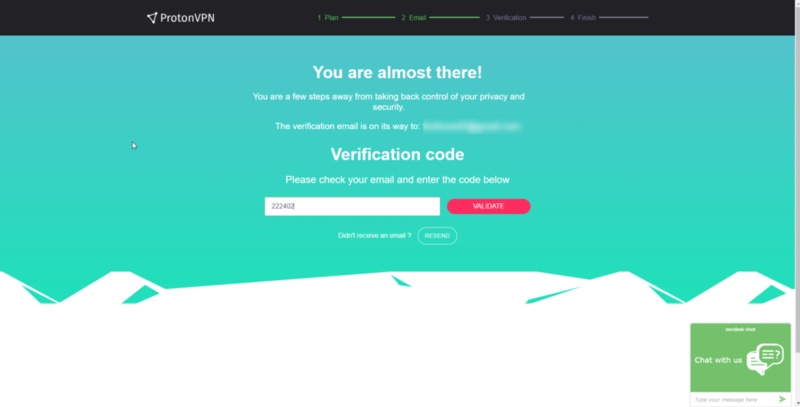 1) In your web browser, go to https://protonvpn.com/free-vpn or click on the “Signup” button on the homepage. 2) The Free plan will be automatically selected. 3) Enter your email address (for recovery email and verification). The recovery email is used in case you lose your password, so you can easily reset it and regain access to your account. 4) Complete the human verification. After proceeding from the previous step you will receive a verification code into your email that you entered before. If you did not receive the email, please check the spam inbox or wait a few minutes before clicking the resend button. Copy the code from the email and paste it into the website as displayed below. 6) Create the username and password. For the first seven days, you will automatically receive a free trial of ProtonVPN Plus. During this period, you will have access to all the ProtonVPN servers and features. 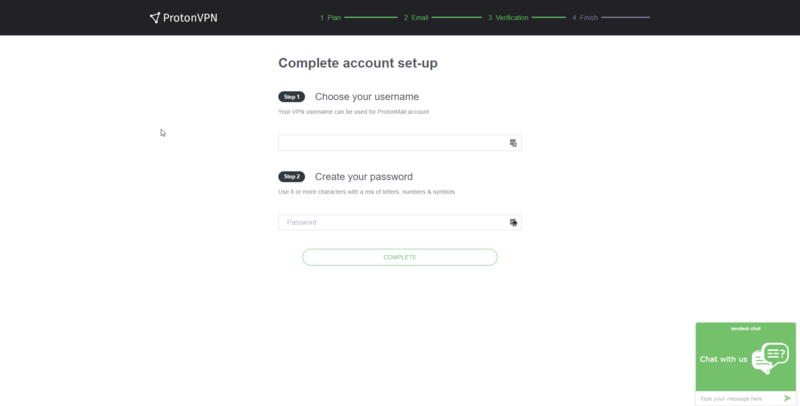 The ProtonVPN trial is activated upon the first successfully established connection. So if you create your account but wait a few days to start using ProtonVPN, you will not lose any of the seven trial days. After your trial days expire, your account will be reverted back to the Free plan automatically. With the ProtonVPN Free plan, you will have access to five ProtonVPN servers in three countries: the Netherlands, Japan, and the US. Also, you’ll be unable to connect multiple devices simultaneously. If you were satisfied with the ProtonVPN Plus service and performance during your seven-day trial, then consider upgrading to one of our paid plans. 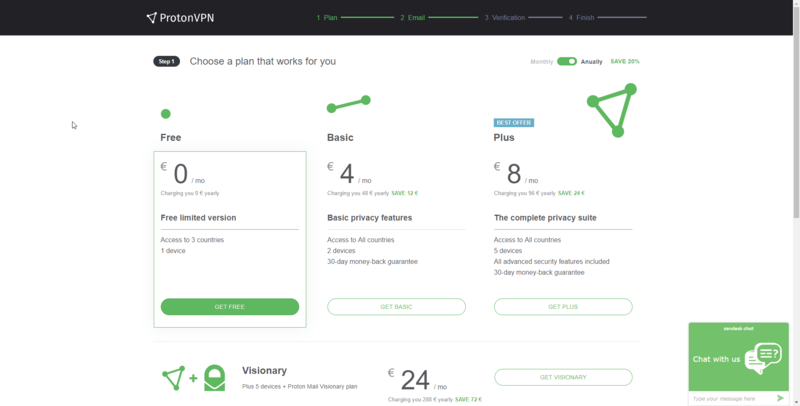 You can compare the ProtonVPN plan-specifications on our pricing page. It says “Email verification temprorarily disabled” but I have never made an account with ProtonVPN. I just found it today on a search engine. 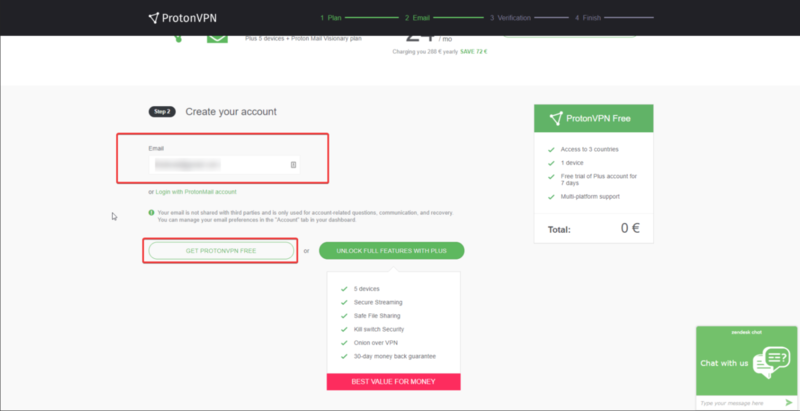 Is there anything I can do to get an account with ProtonVPN? Also, how long is the duration of the free limited Countries and connections version? How many Days, weeks, months, years? Or is it forever with these limits? Hello Romano, There are no limits on data/time/speed on free services, only device limit to one and to three countries. if you are using a proxy, make sure its off, or any other VPN. If not , give it some time since your IP got flagged for more than one attempt of creating the account, so some time away from the page will help you. Hello, I want to create an account, but when I verified my email, the notice said “email verification temporarily disabled”. What should I do? Thanks in advance. Hello. That means that you have tried to create an account too many times and as we have to have anti-bot or spam system that prevents from multiple free account creation you have to wait some time and try again later. will it secure me from IP trace if i use free account ? Hello. Yes, since even free subscription tier is treated the same way as paid. Pourquoi nous ne pouvons pas utiliser notre adresse de confiance protonmail pour la vérification: “To fight spam, please verify you are human. We do not permanently save your email or phone number, it is deleted after verification. You can’t use protonmail as it demands you to use a 3rd party email. Even then it doesn’t send the verification email, I guess you don’t want people using your service. Hello Mike. We can assure that the email verification is truly working and we do want people to become our community members. 3rd party email is required due to the spamming, its just for the security reasons. We’ve sent out the invitation to join our services without the human verification.